What is the extent of hunger in Latin America and the Caribbean? When most people think about hunger and malnutrition, they think about sub-Saharan Africa. However, hunger and malnutrition are serious problems all over the world, including in Latin America and the Caribbean. While excellent progress has been made to reduce hunger and malnutrition in the Latin America and Caribbean (LAC) region over the past 15 years, hunger still affects over 34 million people who live there (FAO, IFAD & WFP, 2015). An estimated 6 million children under 5 years of age in the LAC region are stunted, indicating chronic malnutrition (UNICEF, World Health Organization & World Bank, 2017). There is reason to be hopeful. 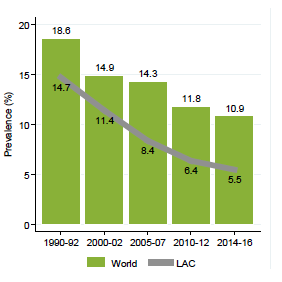 The percentage of people in Latin America and the Caribbean who are affected by hunger (Figure 1) has decreased from 15% in 1990–1992 to 6% in 2014–2016 (FAO, IFAD & WFP, 2015). The reductions seen in hunger in Latin America and the Caribbean have been greater than those seen globally, indicating that the progress achieved in this region has been faster than that seen in other regions, such as Africa and Asia. Figure 1. Trends in undernourishment in the world and in Latin America and the Caribbean (% of population). Source: FAO, IFAD & WFP, 2015. While this substantial progress in the region has been positive and encouraging, the improvements have not been evenly distributed in the region or within countries. In 2014-2016, 20% of the Caribbean population experienced hunger, compared to approximately 6% in Latin America (Figure 2; FAO, IFAD & WFP, 2015). This difference is largely driven by the high rates of undernutrition in Haiti, where it is estimated that 22% of children under the age of 5 are stunted – short for their age, indicating chronic undernutrition. This is particularly notable because 75% of the population affected by undernutrition in the Caribbean sub-region live in Haiti alone. Guatemala has the highest prevalence of stunting (49.8%) in the LAC region, but even this sobering statistic obscures uneven rates of stunting within the country. Among parts of Guatemala’s western highland Mayan communities, stunting affects almost 70% of children under the age of 5 (USAID 2014). Figure 2. Prevalence (%) of hunger in Latin America and the Caribbean, by subregion. Source: FAO, IFAD & WFP, 2015. The rates of undernutrition have decreased in Latin America and the Caribbean since 1980, while simultaneously the rates of overweight and obesity have been steadily increasing (Black et al., 2013). In 2015, it was estimated that among children under the age of 5 in this region, 12% were stunted and 7% were overweight (FAO, IFAD & WFP, 2015). This is a change that is seen throughout much of the developing world – commonly referred to as the “double burden of malnutrition”, where both undernutrition and overnutrition are health problems faced in the same population at the same time. The rise in overweight and obesity is primarily caused by changing diets, as processed foods and sugar-sweetened beverages (e.g., sodas) become more available and affordable all across the world. These foods are high in calories, but low in nutrients. As these foods replace more traditional diet staples (such as whole grains and vegetables), people gain weight but they may still be inadequately nourished and even deficient in some micronutrients. Thus, this is another form of malnutrition, called overnutrition, which is becoming more problematic in Latin America and the Caribbean. The FAO estimates that overweight affects 2.5 million children under 5 years old in South America, 1.1 million in Central America, and 200,000 in the Caribbean (FAO, IFAD & WFP, 2015). The challenges posed by both overnutrition and undernutrition already place a toll on the health systems in Latin America and the Caribbean. However, another important nutritional issue is the problem of “hidden hunger,” or micronutrient deficiencies. Iron deficiency and anemia is the most widespread nutritional deficiency throughout the world. Anemia is a condition where the body has an insufficient number of red blood cells and too little hemoglobin (which carries iron) in the blood. When the body doesn’t have enough hemoglobin, it cannot deliver enough oxygen to all the cells in the body. Anemia is often caused by not getting enough iron in the diet (iron-deficiency anemia), but can also be caused by infections or deficiencies in other nutrients, such as folate. Anemia and iron deficiency most seriously affect infants, pregnant women, young children and women of childbearing age. The consequences of anemia and iron deficiency include poor cognitive development in children, increased infant and maternal mortality, fatigue, and reduced capacity for physical work and mental concentration (e.g., schooling). In Latin America and the Caribbean, anemia and iron deficiency are the most common micronutrient deficiency, affecting approximately 45% of children and 23% of women of reproductive age (FAO, IFAD & WFP, 2015). The countries with the highest rate of anemia among women of childbearing age are Panama and Haiti (40% and 46%, respectively), while the highest rates among children under 6 years old are Guatemala, Haiti, and Bolivia (48-61% prevalence) (Mujica-Coopman et al., 2015). Vitamin A deficiency is a large public health problem in many developing countries around the world. Deficiency in vitamin A is serious because it is the leading cause of preventable childhood blindness, and if prolonged, can lead to increased mortality due to infections. A number of countries in Latin America and the Caribbean still have moderately high vitamin A deficiency in children, including Peru, Honduras, Argentina, Ecuador and Brazil (prevalence from 14-17%), while the problem is severe in Colombia, Mexico and Haiti (prevalence from 24-32%) (Cediel et al., 2015). Zinc is an essential trace mineral for a variety of functions in the human body, but particularly for growth in children. Zinc deficiency can cause impaired immune function and poor growth in children. Many countries in Latin America and the Caribbean do not assess zinc status in the population. However, among the countries that do collect this information, Mexico, Colombia, Ecuador and Guatemala all have high prevalence (19-56%) of zinc deficiency among children and women aged 12-49 years (Cediel et al., 2015). Other countries that are believed to be at high risk of zinc deficiency include Belize, Bolivia, El Salvador, Guatemala, Haiti, Honduras, Nicaragua and Saint Vincent and the Grenadines. The direct cause of undernutrition in Latin America and the Caribbean is mainly dietary intake that is insufficient in quality and/or quantity. However, there are many underlying causes that contribute to poor diets, including structural inequality, poverty, sanitation and hygiene, and emergencies. Poverty in the region has been declining steadily since 1990, although progress has slowed down since the global financial crisis of 2008-2009 (ECLAC, 2014). In 1990, 13% of the population lived on less than $1.25 per day, but that percentage has declined to 4% in 2015 (United Nations, 2015). Poverty is the primary underlying cause of malnutrition in Latin America and elsewhere in the world. Quite simply, families living in poverty don’t have the resources to buy sufficient quantity or quality of food to sustain a healthy diet. Poverty most severely affects women, children, and indigenous peoples. Access to water and sanitation facilities is an important component of health and is critical to the proper preparation and consumption of food that is free of contamination. When people don’t have access to clean water and sanitation facilities, they are at risk of infections that are spread through contaminated food and water. These kinds of infections, especially when they are frequent or repeated, can contribute to malnutrition because they cause loss of nutrients through diarrhea and decreased appetite. Latin America and the Caribbean have made tremendous progress in access to clean water and sanitation facilities over the past 15-20 years. Many countries in the region have nearly 100% coverage for water supply and at least 90% coverage for access to sanitation facilities, including Barbados, Belize, Chile and Uruguay (FAO, IFAD & WFP, 2015). However, once again progress has been uneven with a number of countries still experiencing problems in this area, such as Bolivia, Nicaragua, the Dominican Republic and Haiti. For example, in Haiti 37.6% of the population lacks access to a water supply and 75% do not have access to sanitation facilities. Natural disasters, such as the 2010 earthquake in Haiti, the 2009 “El Nino” drought, and the outbreak of coffee rust disease, contribute to undernutrition throughout Latin America and the Caribbean. When disasters strike, families can lose their homes and livelihoods, and are exposed to injury, disease, and soaring food prices. Furthermore, natural disasters can ruin crops in the region, and have a direct and immediate impact on local food production and food security. Families that are financially stable and food secure before a disaster occurs may become food insecure and impoverished in the aftermath of an emergency. Poor families are even worse off because they have few resources to help them cope with and recover from the financial and nutritional shocks of an emergency. Latin America and the Caribbean is a region particularly vulnerable to the negative effects of climate change, which include natural disasters such as flooding, earthquakes, droughts and hurricanes. The frequency of these types of natural disasters has been increasing in recent decades (Figure 3; FAO, IFAD & WFP, 2015), and each natural disaster places the population at greater risk of injury, mortality, poverty and malnutrition. Figure 3. 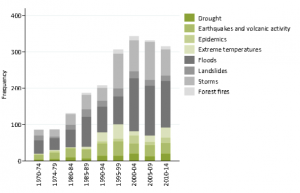 Frequency of natural disasters in Latin America and the Caribbean, 1970-2014. Source: FAO, IFAD & WFP, 2015). Child malnutrition in Latin America has serious consequences for both individuals and society. Malnutrition during childhood is associated with poor cognitive development, lower levels of educational attainment, and greater illness and mortality. On a larger, societal level child malnutrition decreases worker productivity and thus reduces the gross domestic product (GDP), an important economic indicator of a country’s productivity. There are numerous interventions and programs that have been found to be effective at reducing undernutrition and micronutrient deficiencies in Latin America and the Caribbean. One of the most effective interventions at improving nutrition and health in the first 2 years of life is the promotion of exclusive breastfeeding for the first 6 months of life, along with supplemental breastfeeding for up to 2 years of age (Bhutta et al., 2008). In food insecure populations, conditional cash transfers have been used to improve nutrition and health status. Conditional cash transfers work by providing money directly to families in need, based on a requirement that they must do something specific in order to receive the money. For example, a conditional cash transfer program may require that the family vaccinates their children, sends their children to school, or feeds them a nutritional supplement. In exchange for meeting these requirements, the family would then receive cash that they can spend however they choose. Evaluations of these kinds of programs have shown that, when designed and implemented well, conditional cash transfers are associated with improved child growth and a reduction in stunting (Bhutta et al., 2008). To combat iron deficiency and anemia, iron fortification of the food supply and iron supplementation of women and children have both been shown to be effective at improving iron status. Similarly, vitamin A supplementation for women, infants and young children has been shown to be effective at reducing vitamin A deficiency in the population. These are only a few examples of effective strategies used to improve nutrition and reduce hunger in Latin America and the Caribbean. There are many more strategies that have been shown to be effective. It is important that the strategy chosen is carefully matched to address the particular nutritional problems faced in the community or population of interest. Editor’s Post Script: This factsheet was written before 2017 hurricanes Irma and Maria impacted the Caribbean. Puerto Rico and neighboring islands may face hunger in the short-term and nutritional impacts over a longer term due to agricultural and livestock losses. Farmers in Puerto Rico suffered a loss of at least $780 million in agriculture yields, according to the agriculture department’s preliminary figures. Its food imports will likely rise drastically above the 85% it currently imports, because local products such as coffee and plantains were devastated. Local staples that stocked in markets are already gone. It may take one to three years, and as much as ten years for some crops to recover. Livestock were also heavily impacted and farmers will need time and resources to rebuild. Black, Robert E et al (2013). Maternal and child undernutrition and overweight in low-income and middle-income countries. The Lancet, Vol. 382 (9890): 427-451. Available online: http://www.thelancet.com/journals/lancet/article/PIIS0140-6736(13)60937-X/fulltext. Accessed on 7/20/17. Cediel, G, Olivares M, Brito A, Lopez de Romana D, Cori H, La Frano MR (2015). Interpretation of serum retinol data from Latin America and the Caribbean. Food and Nutrition Bulletin, 36(S2): S98-S108. Available online: http://journals.sagepub.com/doi/abs/10.1177/0379572115585743?url_ver=Z39.88-2003&rfr_id=ori:rid:crossref.org&rfr_dat=cr_pub%3dpubmed. Accessed on 7/30/17. Cediel G, Olivares M, Brito A, Cori H, Lopez de Romana D (2015). Zinc Deficiency in Latin America and the Caribbean. Food and Nutrition Bulletin, 36(S2): S129-S138. Available online: http://journals.sagepub.com/doi/pdf/10.1177/0379572115585781. Accessed on 7/30/17. Economic Commission for Latin America and the Caribbean (ECLAC) (2014). Poverty in Latin America. Infographic. Available online: http://www.cepal.org/en/infographics/poverty-latin-america. Accessed on 7/30/17. FAO, International Fund for Agricultural Development (IFAD), and the World Food Programme (WFP) (2015). 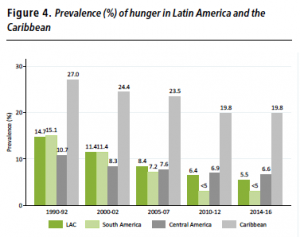 Regional Overview of Food Insecurity in Latin America and the Caribbean. Available online: http://www.fao.org/3/a-i4636e.pdf. Accessed on 7/23/17. Martinez R & Fernandez A (2008). The cost of hunger: Social and economic impact of child undernutrition in Central America and the Dominican Republic. Economic Commission for Latin America and the Caribbean (ECLAC). United Nations: Santiago, Chile. Mujica-Coopman MF, Brito A, Lopez de Romana D, Rios-Castillo I, Cori H, Olivares M (2015). Prevalence of anemia in Latin America and the Caribbean. Food and Nutrition Bulletin, 36(S2): S119-S128. Available online: http://journals.sagepub.com/doi/pdf/10.1177/0379572115585775. Accessed on 7/30/17. World Food Programme (WFP) (2014). 11 Myths about malnutrition in Latin America. Available online: https://www.wfp.org/stories/myths-malnutrition-latin-america-gain. Accessed on 7/23/17. World Food Programme (WFP) (2017). The cost of the double burden of malnutrition: Social and economic impact. Summary of the pilot study in Chile, Ecuador, and Mexico. Available online: https://www.wfp.org/content/2017-cost-double-burden-malnutrition-social-and-economic-impact?_ga=2.169971488.1481270154.1502141741-1526175516.1493387383. Accessed on 7/24/17. UNICEF, World Health Organization, and World Bank (2017). Joint Child Malnutrition Estimates: Levels & trends in child malnutrition. Available online: http://apps.who.int/gho/data/node.main.NUTWHOREGIONS?lang=en. Accessed 7/27/17. United Nations (2015). MDG success springboard for new sustainable development agenda: UN report – Latin America and the Caribbean Regional Progress. Available online: http://www.un.org/millenniumgoals/2015_MDG_Report/pdf/MDG%202015%20PR%20Regional%20LAC.pdf. Accessed 7/23/17. United States Agency for International Development (2014). Guatemala Nutrition Profile. Available online: https://www.usaid.gov/sites/default/files/documents/1864/USAID-Guatemala_NCP.pdfAccessed 9/13/17. World Food Program. February 2016. El Niño, drought blamed as severe food insecurity doubles in 6 months in Haiti. Available online: http://www.wfp.org/news/news-release/el-nino-drought-blamed-severe-food-insecurity-doubles-6-months-haiti. Accessed 7/25/17.